The following tutorial shows how to convert a .wps file created with Microsoft Works to a PDF document with the novaPDF converter. If you do not have novaPDF on your computer, use the Download page to download and install it on your computer. Microsoft Works is a feature stripped version of the Microsoft Office that has been discontinued in 2007. Due to this, the article below will not be updated anymore, but if you still have Works installed you can use novaPDF to convert wps to PDF. The application contained a word processor, a spreadsheet and a database management tool. Being a lightweight version of the Office, Works can open and edit all the file types native to Word, Excel and Access and this is also available the other way around, as you can open all the proprietary Works file types with Microsoft Office. The different between these two suites is the target user base as Works was designed for home use and small businesses only. The WPS file extension is native to MS Works however it can also be opened and edited by MS Word, MS Publisher and even LibraOffice. This has been made possible because of a library component called libwps, included in LibraOffice but not in the other popular word processing applications such as OpenOffice, AbiWord, or KWord because of the Joint Copyright Assignment. This is why having the file in PDF format is a huge difference as you do not have to worry about any compatibility, copyright or portability issues. novaPDF also contains advanced features to make your file conversion seamless and to make possible adding information to the files afterward. Also having the file as a PDF makes downloading and installing Microsoft Works (or any other word processing tool capable of opening the wps format) unnecessary as all you need is a PDF reader to be able to manage the document further and there are many PDF viewers available to use. 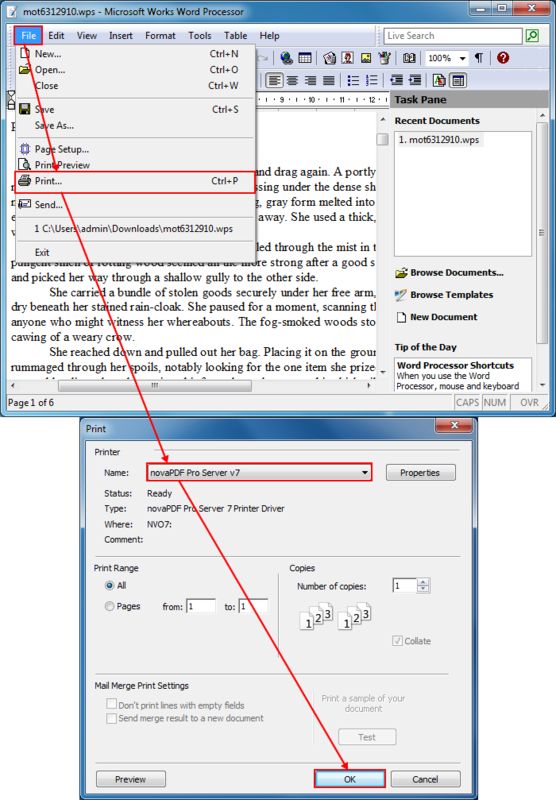 Open the Works Word Processor and browse for the file you wish to convert to PDF by selecting File then Open or pressing Ctrl+O. Once you have opened the file, select File->Print or press Ctrl+P to access the Print Window. Select novaPDF from the printer name drop-down list and click OK. In the Save PDF File As dialog choose the path you want to save the PDF file to and the PDF name if needed and add additional options like PDF merging or Sending mail upon conversion. Click OK and the file will be converted to PDF and any additional actions that have been selected will be performed on it after conversion. Since the MS Works application is no longer available for usage, making the wps file format and obsolete one, keeping your files as PDF is recommended for further usage and deployment. Also with the help of the novaPDF converter you can add annotations to your files, watermarks, bookmarks, sign all your files, password-protect them and more. This tutorial shows how to convert a project created with Microsoft Office Project to a PDF file. novaPDF is a PDF converter that allows creating PDF files from any Windows application that supports printing. If you don't have novaPDF installed, use the Download page to download and install it. The following article is about converting a csv file format to a pdf document by using several programs with support for the file and the novaPDF printer driver. If you do not have novaPDF installed on your computer, use the Download page from our website do download and install this application.